The R165 Patio Chaise Lounge has the distinctive flat-arm design that gives it a rich appearance. 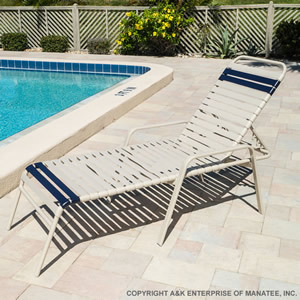 This versatile chaise can be paired with any of the R line or C line patio furniture. The wide armrest is comfortable for users and the generous seat height makes this chaise easy to get on and off of. The R165 has a powder-coated, extruded aluminum frame with double-wrapped vinyl strapping that can be customized in any frame/strap color combination to match your property!